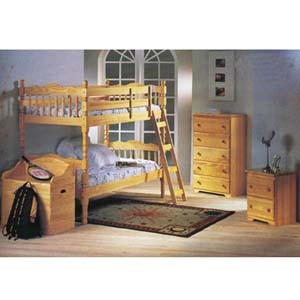 Bunk Bed 4 Pcs Set. Natural color. Matress not included. Bunk bed set. Easy to assembly. Night Stand (acme2292) 20x17x22H. Twin/Twin Convertible Wooden Bunk Bed (acme2299) 80x41.5x61.5H. Five Drawed Chest (acme2296) 30x17x44H. Toy Chest (acme2297) 30x18x29H. All items can be sold separately.